Jose Mourinho continued his success with Chelsea as he led the Blues to back-to-back titles with another memorable campaign in 2005/06. Club-record signing Ghanaian midfielder Michael Essien was joined by defender Asier Del Horno and winger Shaun Wright-Phillips in the Chelsea squad and Mourinho's side started where they left off in 2004/05 by winning their first nine Premier League matches, including a 4-1 victory over 2005 UEFA Champions League winners Liverpool. Their opening match, though, was far from straightforward as they relied on a stunning late strike from Hernan Crespo to break the resistance of newly promoted Wigan Athletic. Mourinho said Wigan "didn't deserve to lose" and the defeat did not deter the plucky newcomers, who were only six points adrift of leaders Chelsea in second place after 12 matchweeks. Charlton Athletic were also among the early frontrunners and summer signing Darren Bent, who scored two goals in their opening-day triumph against Sunderland, and Danny Murphy won the first two Player of the Month awards of the season. Manchester United, looking to win their first Premier League title in three seasons, recruited Fulham goalkeeper Edwin van der Sar and South Korean star Ji Sung-Park in the summer. The Red Devils inflicted Chelsea's first defeat of the league campaign as Darren Fletcher's header sealed the three points in their November clash at Old Trafford. The previous week, bottom-club Everton ended the Blues' perfect start. The Toffees, who secured a fourth-place finish in 2004/05, started a run of 13 points from a possible 18 with a draw against Chelsea as they dragged themselves out of the drop zone. After a slow start to the new campaign, Liverpool secured 10 consecutive victories to move into third place at the turn of the year. One of those wins was against Wigan, who finished 2005 in the top six despite a dip in form, with summer-signing Peter Crouch ending an 18-match wait for his first Liverpool goal. Another English striker who secured a summer move was Michael Owen and Newcastle United's new signing scored a hat-trick in a 4-2 triumph over West Ham United in December. He netted seven goals in 11 league matches during an injury-hit first season on Tyneside. Strike partner Alan Shearer became the club's all-time top scorer in a 2-0 triumph over Portsmouth in February and he scored his 260th and final Premier League goal in a Tyne-Wear derby victory against Sunderland in April before retiring. His tally remains the highest in the competition's history. At the turn of the year, Chelsea were 11 points clear at the top, with Man Utd and Liverpool their nearest rivals. A record 164 consecutive Premier League appearances for Blues midfielder Frank Lampard ended on 28 December when he was ruled out with a virus but he picked up from where he left off and scored 16 league goals overall. January moves for Nemanja Vidic and Patrice Evra galvanised Man Utd and, despite David Bentley scoring a hat-trick in Blackburn Rovers' win against them in February, they reduced the gap to only seven points in the title race. However, a surprise goalless draw for the Red Devils at home to Sunderland in April put Chelsea on the brink of the title. 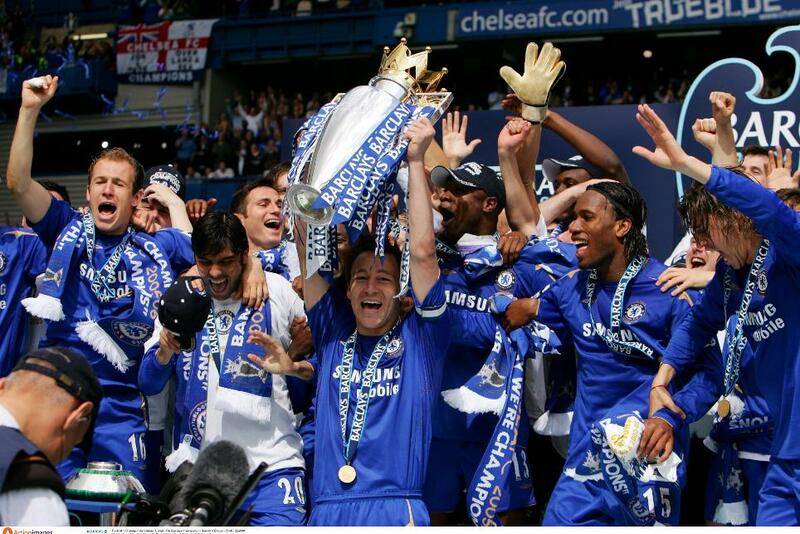 Their second Premier League crown was sealed against Man Utd at the end of the month. William Gallas and Ricardo Carvalho scored either side of a wonderful solo effort from Joe Cole as they lifted the trophy at Stamford Bridge with two matches to spare. They also equalled their own record of 29 league wins with that triumph. An exciting battle for fourth place between north London rivals Arsenal and Tottenham Hotspur went down to the final day. Spurs were one point above Arsenal going into the final match but they lost 2-1 to West Ham. Arsenal, wearing special redcurrant shirts similar to the jerseys they adorned in their first season in north London in 1913, capitalised in their final match at Highbury before the club moved to Emirates Stadium. Thierry Henry sealed the Golden Boot with a hat-trick as they beat Wigan Athletic 4-2. At the bottom, Portsmouth, with Harry Redknapp returning as manager after a spell with rivals Southampton, were eight points adrift of safety before two stunning goals from Pedro Mendes gave them a vital victory over Man City on 11 March. They won six of their last nine matches and secured safety with a win at Wigan in the penultimate game of the season. The three relegated clubs were Birmingham City, West Bromwich Albion and Sunderland. Both major European finals included English sides, with Arsenal and Middlesbrough losing the UEFA Champions League and UEFA Cup finals respectively. Boro's loss to Sevilla was also the final match in charge for manager Steve McClaren, while Alan Curbishley stepped down after 15 years in charge of Charlton.